I have been wanting to do another oversized Hoop Art ever since I did my US Map Hoop – it’s so fun to work on a little bigger scale. 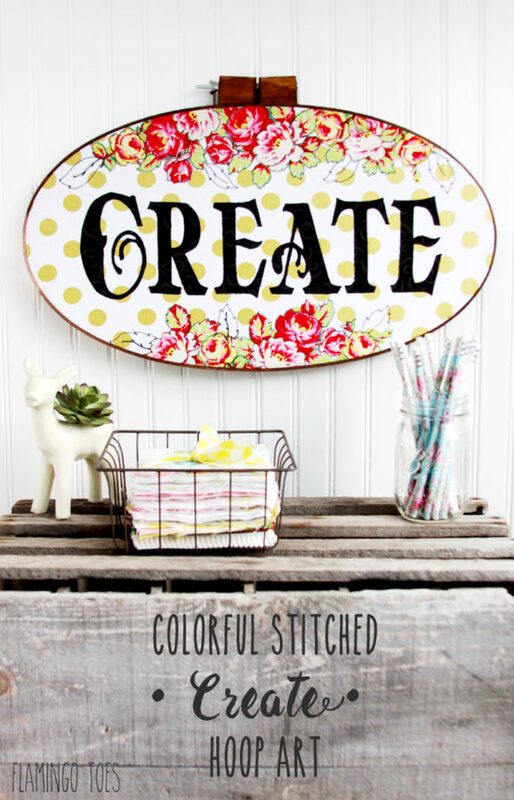 And let’s face it, I’m always looking for an excuse to make another hoop! 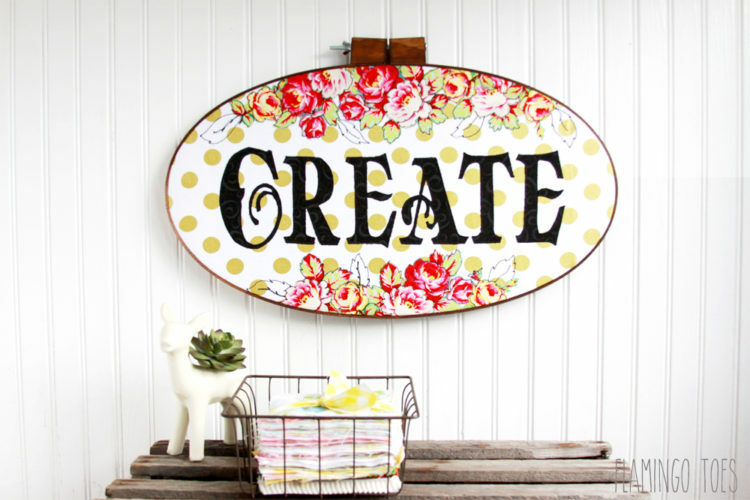 So when Rachel from R and R Workshop emailed about participating in her polkadot challenge, I knew it would be perfect for creating a big , fun, polkadot hoop art! 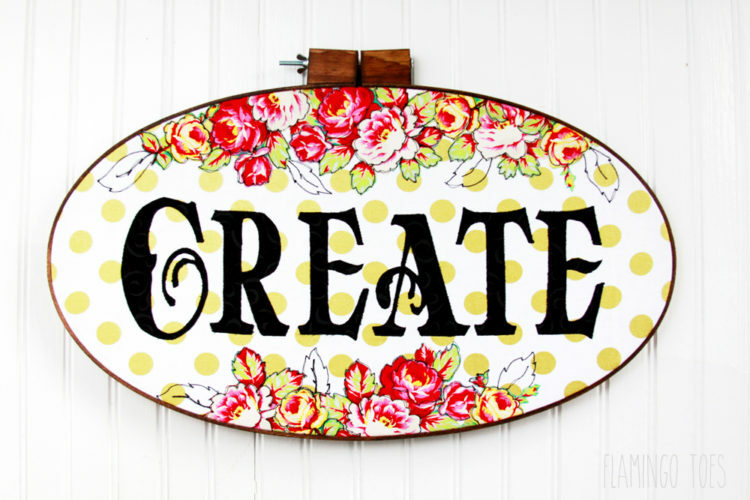 I decided to make something for my craft room so I added the word “Create” and some pretty sketchy stitched roses. 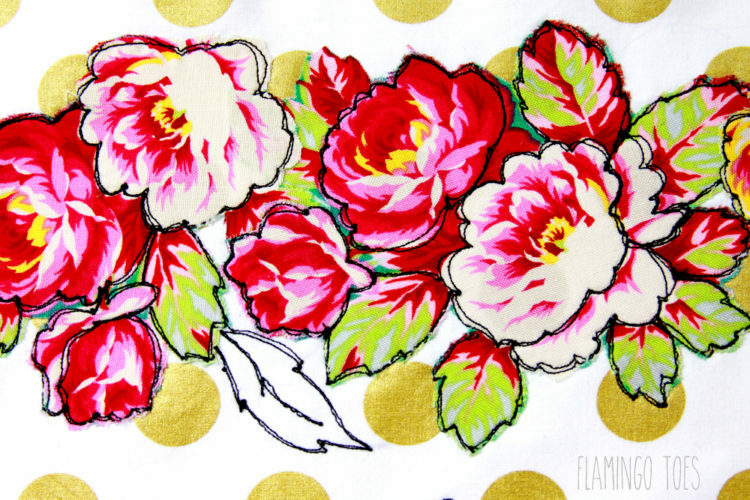 I love the way the stitching makes the flowers look like they’ve been outlined with pen. It’s an easy hoop to make – and if you don’t want to do the stitching it would be super easy to do as a no-sew hoop too! You could actually outline the flowers with a pen, add a few sketched leaves and you’d be good to go! If you would like to stain your hoop, I recommend doing that first. You want the wood to be completely dry so you don’t transfer any residual stain to your fabric as you’re placing it in the hoop. Remove the top screw and stain only the outer oval of the hoop. Make sure you wipe off all excess stain. 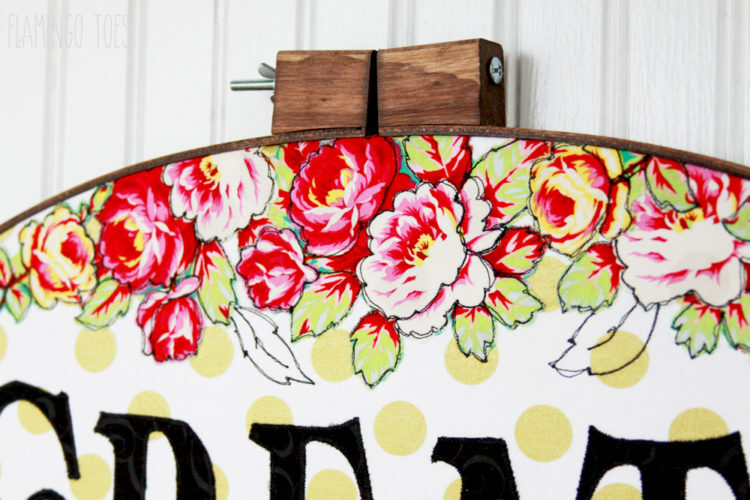 Begin by deciding how many flowers you’d like across the top and bottom of your hoop. Cut a rough shape around the flowers and iron fusible webbing to the back of the fabric. Cut out the details on the flowers. Iron fusible webbing to the back of your letter fabric. Cut out all your letters. Remove the paper backing from all your pieces. 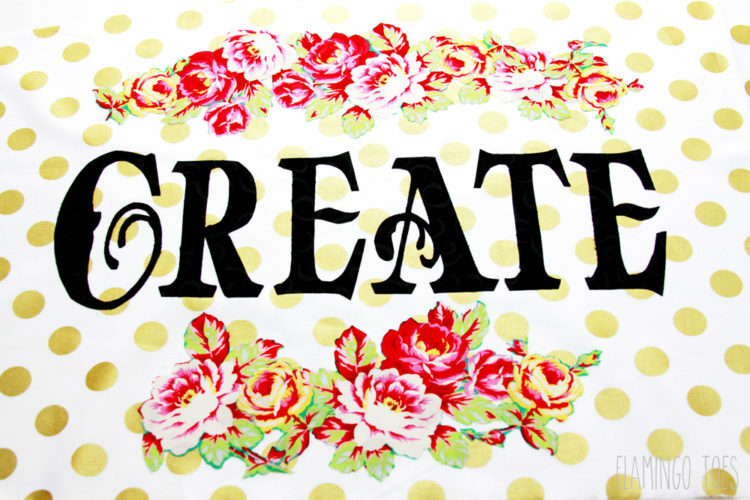 Lay the flowers and letters out on your fabric. Set the hoop over the fabric pieces to make sure you like the layout and spacing. Once you’re happy with everything, iron your pieces in place. Iron heavyweight interfacing to the back of the fabric. This will make it so you can’t see through your fabric in the hoop, and it will give it stability if you add in the sewing. 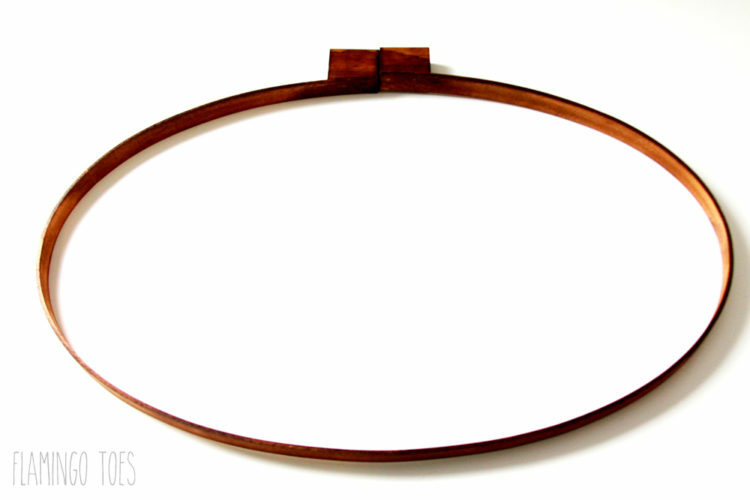 Now you can stop here, and make this a no-sew hoop as I mentioned up above. Just skip to the instructions for putting your hoop on the fabric! If you want to add details to your flowers, you could sketch around the roses and leaves with a fine point pen. 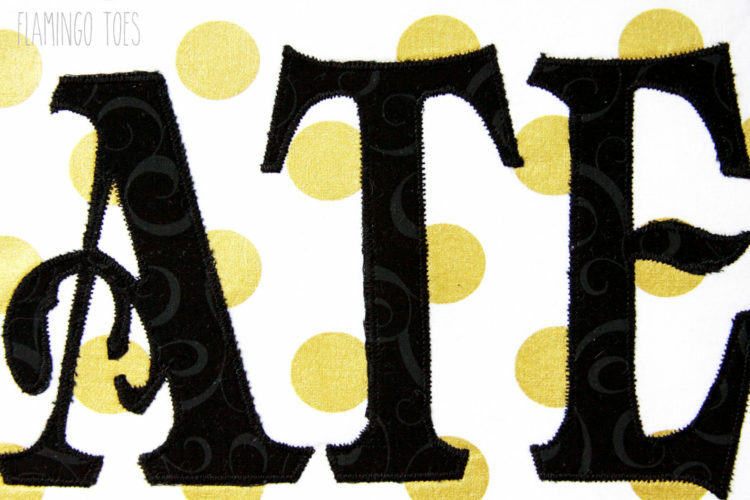 If you want to add in the stitching, outline your letters with a small zigzag stitch. To sketch around the flowers, put your free-motion foot on your machine. 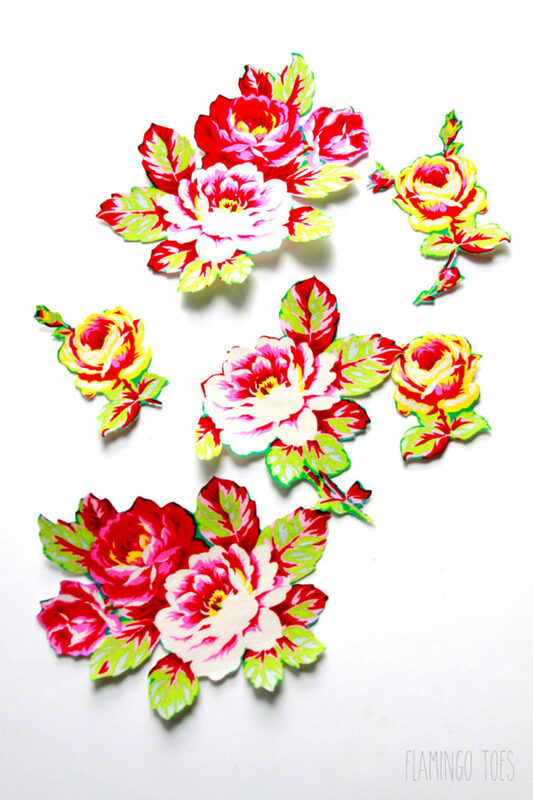 Sew around the edges of the flowers and leaves, sewing some of the details as you go. 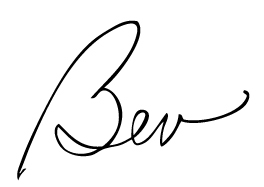 Go over the stitching lines two or three times to give it that “sketched” look. Add in a few leaves if you want that are just stitching. Press the fabric well to get out any little ripples or gathers around the stitching. 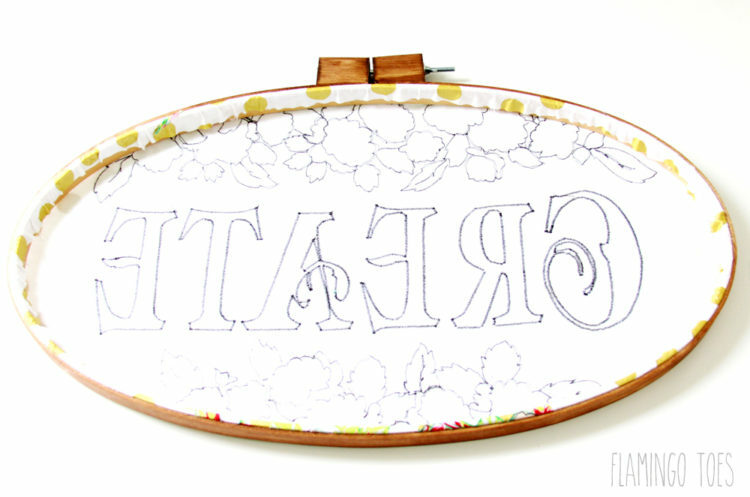 Place the fabric over the smaller oval, making sure you center the letters and flowers. Add the screw back to the top oval and place it over the fabric, pulling the fabric tight. Tighten the screw to hold the fabric in place. Once the fabric is in the hoop tightly, trim around the outer fabric about 1″. Glue the fabric down to the inside of the hoop. 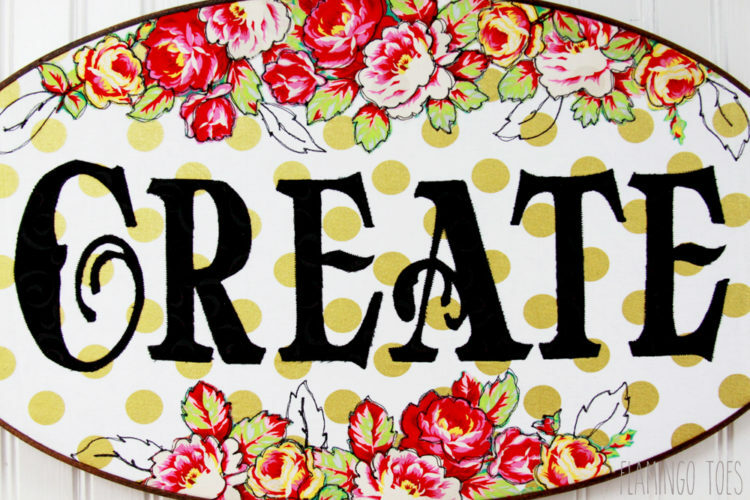 If you want, you can finish the back by gluing a piece of felt on the back side of the oval. 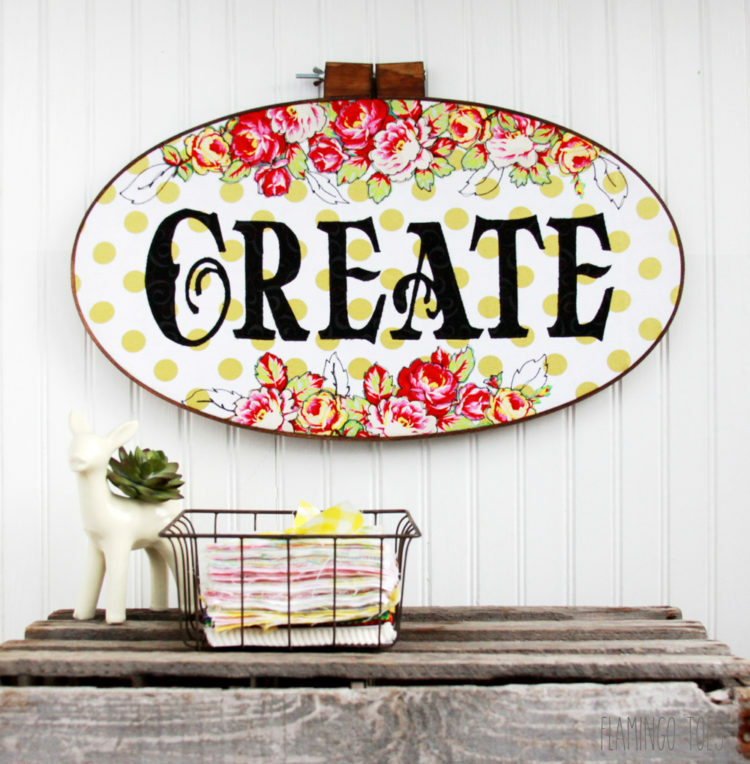 You can really create this same style of hoop with any word! Wouldn’t it be so cute for a child’s room as well? 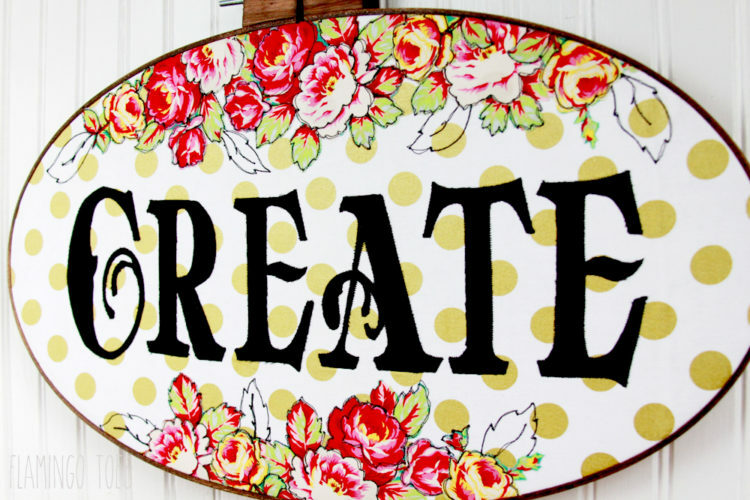 Or a Home Sweet Home sign? So many options! I’d love to see a photo if you make one! 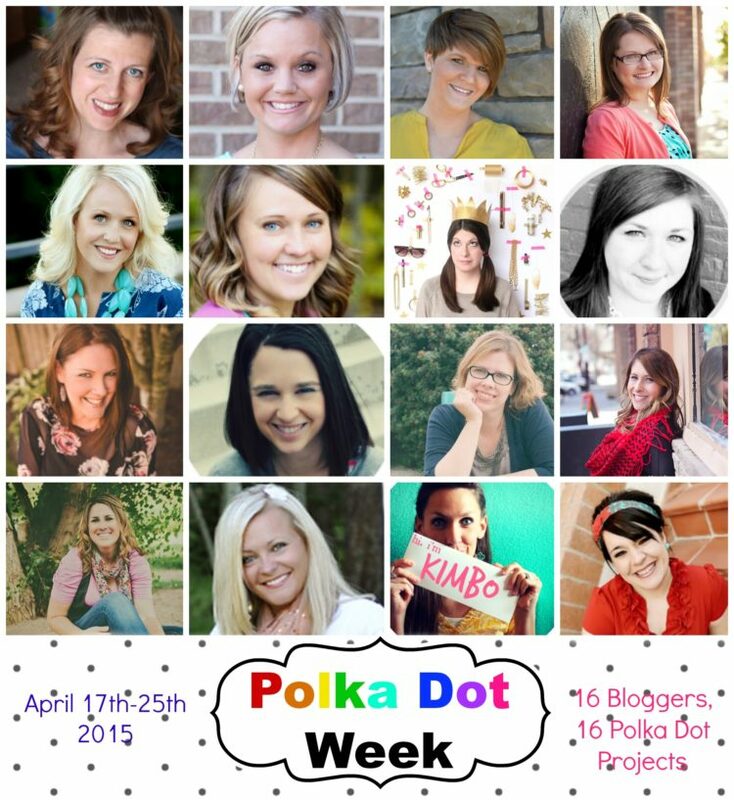 Make sure you go check out all the other Polkadot Projects at R and R Workshop – there are so many cute ideas!! You are so versatile and so talented. I like the rustic wooden table it’s sitting on also. Your home sounds like an invitation to calm, and full of love. Will there ever be a chance of us getting a tour so that we can ooh and ahh? Just . so . pretty ! 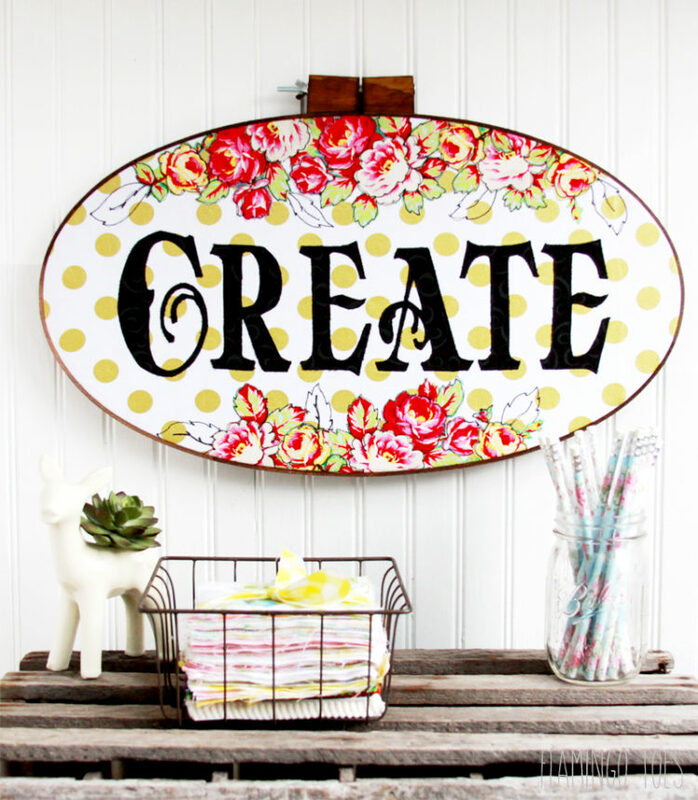 Love polka dots, love floral, love creating – did you make this just for me? 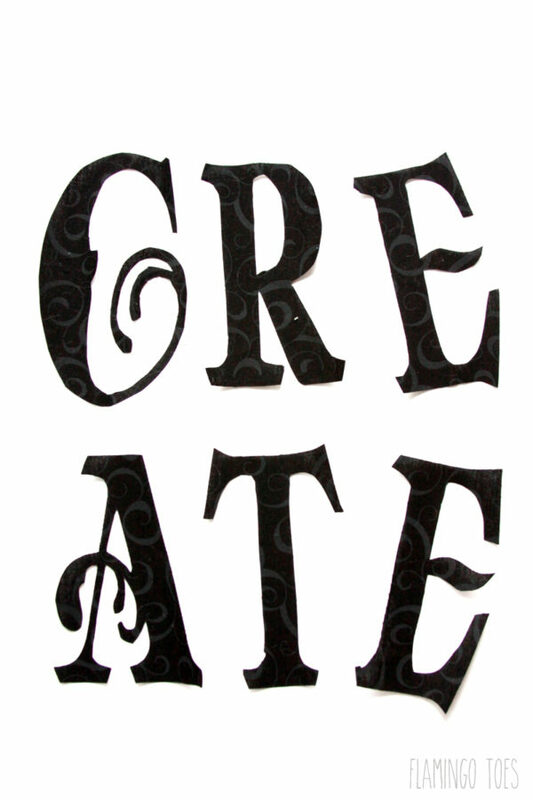 Can’t wait to see what you do with it in your craft space!! Such an inspirational piece!